The outlet of the water tank would need to be 10 feet above the shower head (for electric) You would be better off with a floor mounted tank with a pump, I would imagine the cost to be 25k. But with floor mounted you have to consider the brownouts we get in this area. hmmmm, 25k is a bit steep for the amount of convenience it would provide I think. Each man has his preferences and learned traditions, but I have come to prefer using the timba & tabo. If you can bend at the waist and raise your arm over your head comfortably, you get instant and flexible amount control, water use efficiency, and minimum cost. You can hedge against temporary water and electrical outages if you keep a larger, full timba in the CR to shower and flush with at will, despite temporary shortages. Not to mention the extra bit of exercise and stretching benefit. Most of the time I don't even mess with the removable shower head, but it is good for those anti-gravity shots if you want or need them. The comforts and ease that modern living brings are wonderful, but dependent on having all systems at go.... which at most of us know.... is not a given here. Have to adhere to the old Boy Scout motto if you want to maintain sanity and peace of mind despite the too oft system failures, so stay flexible. We keep a Timba in the shower for those times the water is off. I wouldn't mind a Tabo shower as much if I could comfortably bend at the waist and raise it over my head, but I can't. I do have a removable shower head which helps when there is low pressure. You would need a tank a pump and an expansion vessel plus you would need to be able to bypass the pump in the event of a brownout. When I got to my ship I started to take a Navy shower and the guys laughed & told me not to bother. Our ship never ran out of water. We were the West Coast test ship for a reverse osmosis machine. The 2 distillers made 200 gallons an hour each, and the RO made 400 gallons an hour by itself. With only 300 people on board, we ended up dumping fresh water overboard 5 or 6 hours every night. We keep a Timba in the shower for those times the water is off. Never heard of a Timba and neither has my GF. Is it regional or something? Never heard of a Timba ﻿and neither has my GF. Is it regional or something? The timba is the bucket, the tabo is the dipper. I live in an old house. The CR is small so I can only use the hand held shower thing for my showers. Only time I use the Tabo is if the water supply tank for the whole subdivision is being cleaned, and have to store water for 1 day. My GF knows what it is now. I was just saying it wrong to her. Thanx. There's a variety of synonyms for dippers and ladles, etc. in Tagalog. I'm sure that Illongo and Cebuano regions have various local words, as you would expect. I usually stick to the Tag, or Pilipino words since TV broadcasts use them a lot, and I'm too lazy to learn the local variations because it just gets too confusing to remember all the variations. I really should focus on the local dialect more, but people understand the Tagalog words as well usually, even if they don't have any idea about the English version. If I lived here year round, I would make the effort to learn many more of the local words and phrases , but most locals know the Tagalog versions, (so my wife confirms to me), so I pretty much stick to that. If you can memorize and use a dozen of the local words/phrases, you're probably doing better than 90% of the ex-pats, I would guess. You will often see signs, "Load Ditto" or "Load Dirri" in the same area where you live. Tagalog and local variations for "Load Here". You will often see signs, "Load Ditto"
...and to stay on topic... 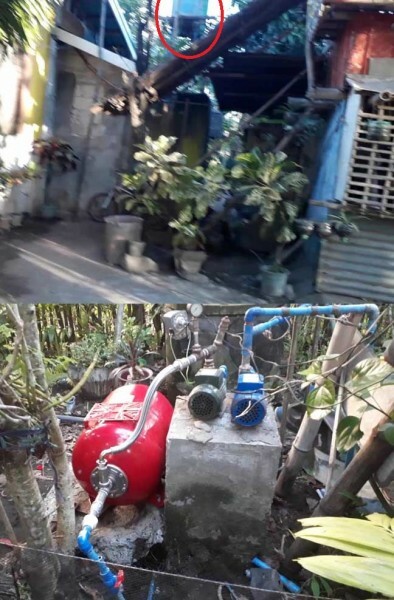 Here is a blurry pic of our water drum (video grab) and a photo of our tank/pump. There is usually a cover, but this was as we were installing the expansion tank. There are 2 houses, one pump for each house. The expansion tank is just for my house. The rooftop setup has a drum for each house (they just fill the drum with the pump, and use gravity feed). We keep our drum filled but only use it for brownouts. Maybe 10 feet off the ground?